I’ve heard that choosing a therapist, counselor, or more affectionately known as a shrink is kind of like choosing a mate. Luckily I have been more successful in the shrink department than the mate department, but that’s a whole other story. So yes, I admit to having psychologically courted a few counselors until I finally found The One. But at least I am working through my issues. The surprising thing is that after years of going back and forth with different counselors, I found my “one” in an older white lady who had years of experience, but in my mind would never be able to help someone like me. When I say someone like me, I’m not saying I’m an alien or anything, but our culture and background on the surface is different. Or so I assumed. I am black, she is white. I am young, she is old…or older. I soon found out that I was wrong. Once I was in a session where I was crying over a man who, for whatever reason, did not want me, but who I knew was perfect for me. Why oh why? What is wrong with me? I don’t understand why he won’t give me a chance. Is my therapist supposed to use the F word? It didn’t matter because that was the recipe I needed to get me out of my rut. The main course was “the truth” for a gentle jolt out of my pity party. Add a side order of compassion to nudge me back into reality. And finally a shot of laughter to wash it all down. Moving on to a different therapy session and me sulking over the same guy. Perhaps he really wasn’t attracted to me; maybe he just slept with me because he felt sorry for me. A couple of days ago, I was in a therapy session where I was blaming everything on myself. I’m just the kind of person who thinks that everything is my fault. Perhaps it’s the conditioning of my conspiracy-theory-filled mother or the paranoia I formed from growing up in an alcoholic home. Or perhaps I’m just crazy. But if there is a conflict, I think it’s my fault. If there is tension, anger, sadness, or fear being expressed…it is my fault. If I experience loss…again, it’s my fault. An otherwise sane person would not think this way. But I have associated myself with every bad thing that occurs. And it gets really extreme sometimes. I could probably find a way to blame myself for the war in Iraq. I never said it made any sense. It’s just what I do. I think it provides me with a level of comfort when things happen that I cannot explain. My therapist told me that this “all my fault” thinking is called “magical thinking.” I was intrigued. I like to think of myself as a pretty magical person, so I thought at first it was a compliment. I was a bit offended. But then I thought, I kind of feel like a child when I think this way. Children can be pretty self-centered. You are not that powerful. I didn’t have a concrete answer. I sat there for a few minutes. Dammit, I was going to explain to this woman why everything is my fault! What kind of analogy could I use? And then the craziest thing popped into my head. “Do you remember Gazoo?” I asked. 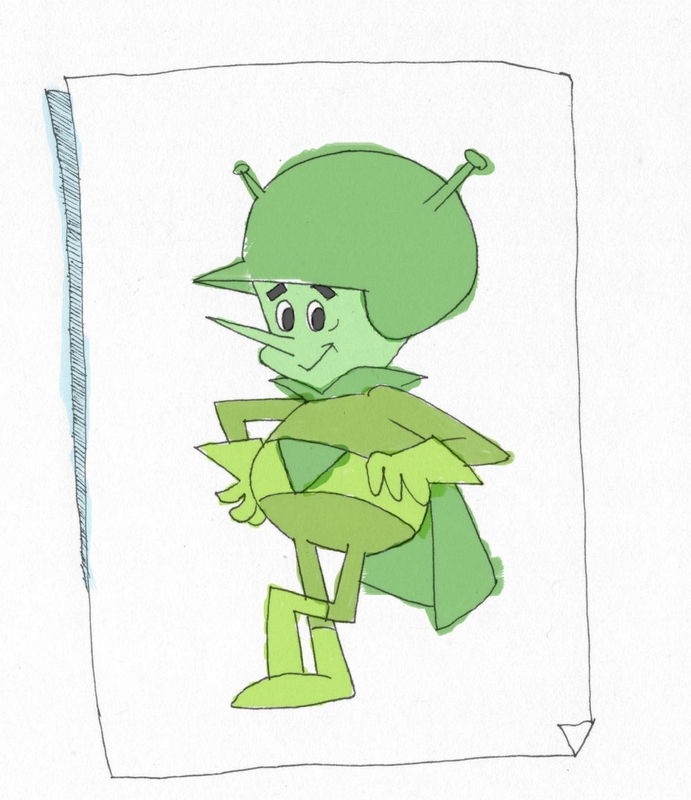 The character’s name was actually the Great Gazoo, and he came in the last season of The Flintstones. He was this little, cute, flying green guy from outer space that spent most of his time with Fred and Barney and constantly caused trouble. He wasn’t bad, just a bit of a pest, and when he tried to help, he would always end up causing more harm than good. When she said that, I had the best belly laugh. I laughed so loud that I’m sure it echoed through her waiting room. My soul was smiling. My shrink had done it again. And so, as I write this, my shrink and I are planning the capture and ultimate murder of Gazoo. Rest in peace. Michele Whitney is a writer, blogger, and musician from Chicago. She is currently a PhD candidate for public service leadership at Capella University where she is working on a dissertation titled: The Human-Animal Bond: A Phenomenological Study of People’s Attachment to Companion Animals. Her writing has been published in the Chicago Sun-Times, Diverse Voices Quarterly, Foliate Oak Literary Magazine, and other venues. Michele’s message of emotional healing, recovery, and connection can be found in her blog, Words of Compassion, Creativity, & Knowledge. Her free time is spent playing the flute, cooking, and practicing aromatherapy. She resides with her mom and her feline kid named Samson. Read an interview with Michele here. This entry was posted in Archives, Essay and tagged summer2012 by Mary Akers. Bookmark the permalink.